There’s no denying Affinity Photo is a great tool for editing, but what if you want to print your photos? Using Affinity Photo for printing is a great choice. But if you have been using other tools like Lightroom, the printing process might not be obvious. 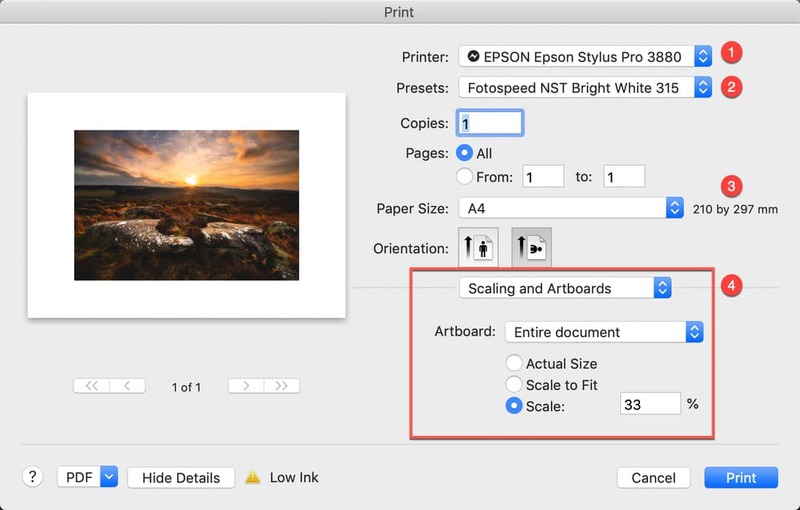 In this article, I will explain how you can produce great prints from your photography with Affinity Photo. Before we do that, however, you need to understand the basic workflow of printing. Think of photo printing in Affinity Photo as a three-step process. I’m assuming here that you’re monitor is correctly calibrated and you’ve edited your photo to look the way you want it to. Apply print or output sharpening to the photo. I’m going to deal with this in a separate future article. Send your photo to the printer. A Soft Proof is a representation of your image on a screen, as it would appear when printed. When you Soft Proof in Affinity Photo the software will automatically simulate the effect of applying ink to paper. In some software like Lightroom, you can choose between simulating ink and paper or not. In Affinity Photo, you don’t need to do this. To Soft Proof your image in Affinity Photo adds a Soft Proof Adjustment Layer to the image. You can do this by clicking the Soft Proof option in the Adjustment Studio Panel (on the right of the Photo Persona). It’s important to ensure the new Soft Proof layer is on top of the Layer Stack. You don’t want any other layers on top of this Soft Proof layer. If it’s not on top, you need to click and drag it to the top before you do anything else. Adding a Soft Proof layer will open the Soft Proof dialog which can you can see below. The first task with the dialog is to select the ICC profile (Proof Profile) for the paper and printer combination you’re using. This is essential and you can just pick a different profile because you don’t have the correct one installed. 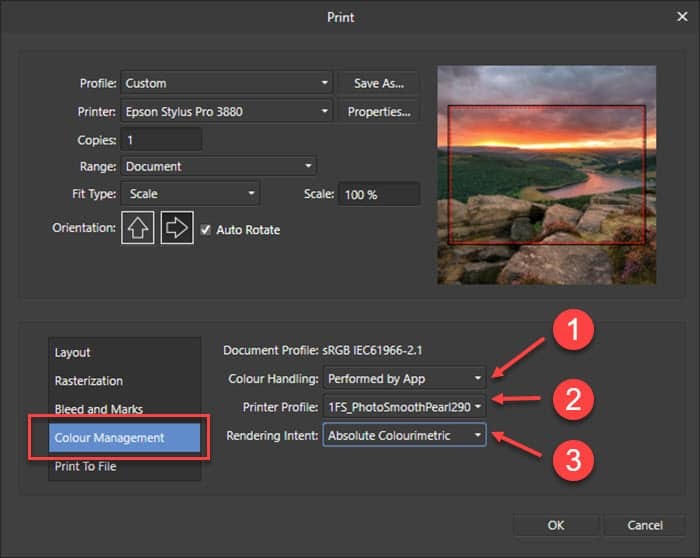 If you don’t select the correct profile, Affinity Photo won’t be able to accurately simulate your print. If you don’t have the correct profile installed on your computer, stop what you’re doing and download it. If there isn’t a profile available, switch to a paper that you can get the profile for. I will repeat, if you don’t use the correct ICC profile, Affinity Photo can’t accurately simulate the print. This is absolutely critical. Next, you need to select the Rendering Intent to use. Absolute Colourimetric is the default and a good starting point for most prints. If you don’t understand what this means and want to know more, watch my Soft Proofing video on YouTube (below). With your Soft Proof Adjustment Layer set up, you should notice that it makes your image look different. How different will depend on the ICC profile and Rendering Intent you select. You can check the difference by turning the Soft Proof layer off and on in the Layers Studio Panel. It’s very likely that the Soft Proof will make the image look a little flat and lifeless, but that’s how your print will look if you don’t correct it. It’s now time to correct your soft proof image so that it looks good again. 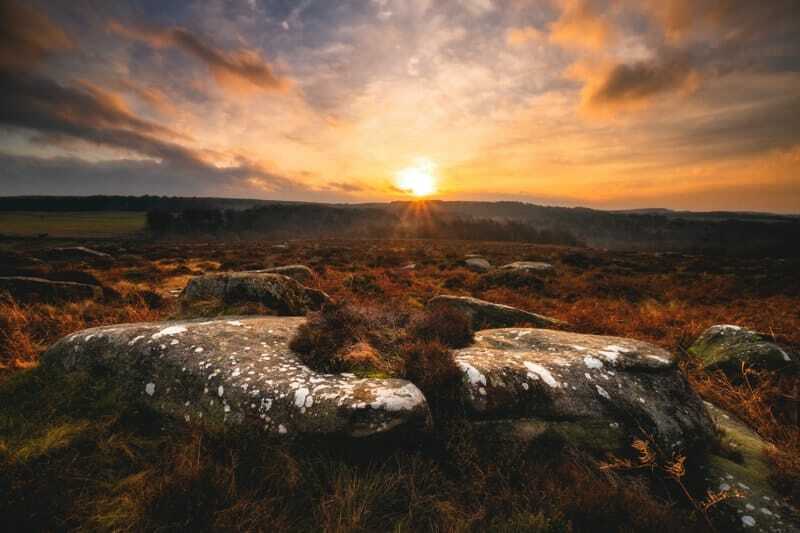 You can do this using Adjustment layers like Curves, Levels, and HSL. Be sure to place your Adjustment Layers beneath the Soft Proof layer in the image Layer Stack. As all this process can seem a little confusing, I decided to record a video demonstrating how to soft proof a photo for printing in Affinity Photo. Please take a few minutes to watch this as it will help make sense of what’s happening. Having corrected your Soft Proof image to look correct on screen, you need to send it to the printer. But just before you do this, be sure to turn off the Soft Proof Adjustment layer so that it doesn’t affect the print. You do though want the corrections you made to be visible so be sure you only turn off the Soft Proof Adjustment layer. 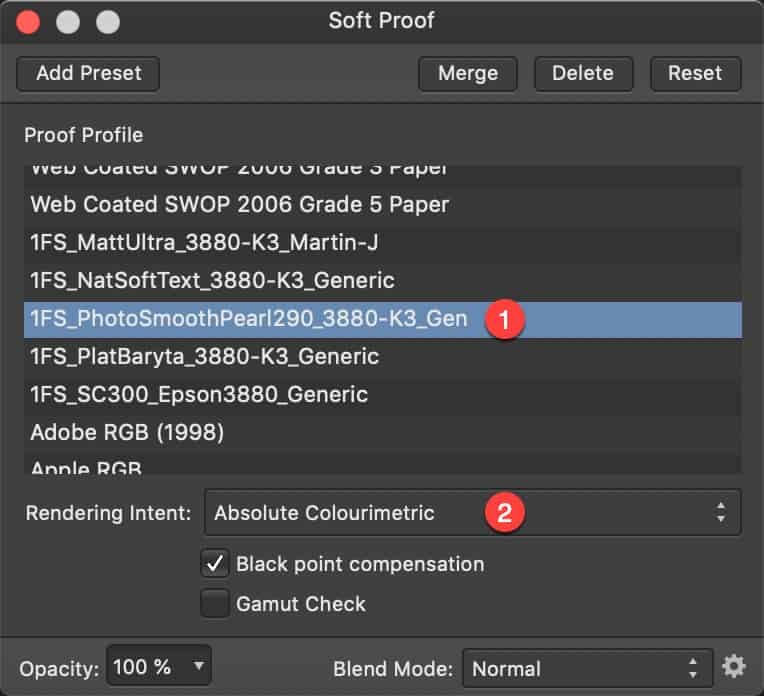 You can now send the image to your printer by selecting “File | Print…” from the Affinity Photo menu. This will display the print dialog as shown below. I took this screen print using the Mac version of Affinity Photo. If you’re using the Windows version the print dialog layout will be different, but the same controls are present if you check carefully. 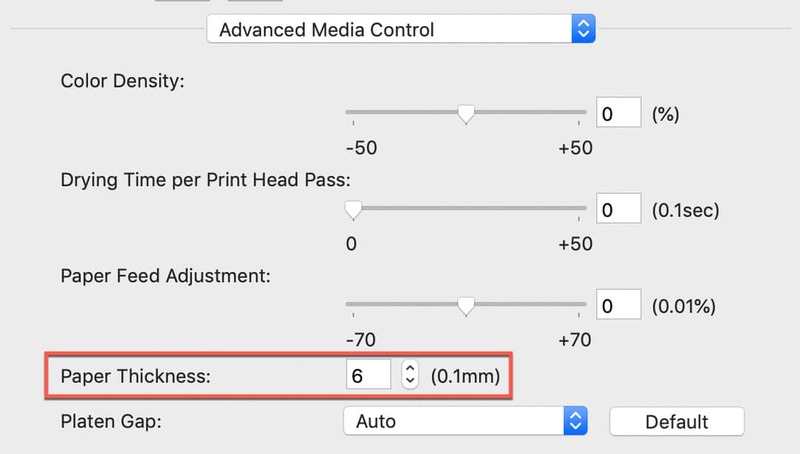 In the Print dialog, there are a few settings that you may need to adjust before hitting that print button. I’m going to ignore the more obvious ones like the number of copies and orientation and instead look at the ones that often cause problems. Be sure to select the correct printer if you have more than one printer installed. Depending on your printer you may find some of the print driver settings (see 4 below) are different from the ones shown in this tutorial. After you have configured your Print dialog you can save the settings as a Preset using this drop-down list. The Preset you create will then appear in the drop-down list for future use. Using a Preset to configure the Print dialog can make printing quicker and less error-prone. Be sure to check the paper size. It’s very easy to select an A4 print when you have A3 paper loaded. This section includes the settings for your printer driver. Use the drop-down list to select the driver settings you want to adjust. Let’s take a more detailed look at the settings on my Mac. Please remember when reading this that I’m printing with an Epson 3880 printer. The settings you see here are for my printer driver on the Mac. Unless you have the same printer driver and setup, your settings may be different. Having said this, if you understand why I have chosen my settings you should be able to configure your own. The Color Matching section allows me to select one of two methods for controlling the printer's colour. The Epson Color Controls provide quite a lot of control over how intense the printer reproduces different colours. What they don’t do is produces an image that matches the soft proof. For that, I need to use the ColorSync option and select the same ICC profile used for Soft Proofing. Here the important things to set are the Media Type and Output Resolution. Notice in this example the media is set to “Ultra Premium Presentation Paper Matte”. Don’t confuse the Media Type with the ICC profile. The two are completely different but sometimes have similar names which can be confusing. The Media Type sets up the printer to expect a certain type of paper, for example, a Matte or Gloss surface. With some papers, you might find the Paper Thickness is an issue. One paper I use is Fotospeed NST 315. This is quite a thick paper and the standard 0.1 Paper Thickness setting doesn’t work. It causes the print head to strike the edge of the paper and smear ink onto the edge of the print. But I can increase the Paper Thickness to 0.6 to avoid this. As I mentioned, the Windows version of Affinity Photo has a different dialog layout. You can see an example below. Select what will perform the Color Handling of the printing. 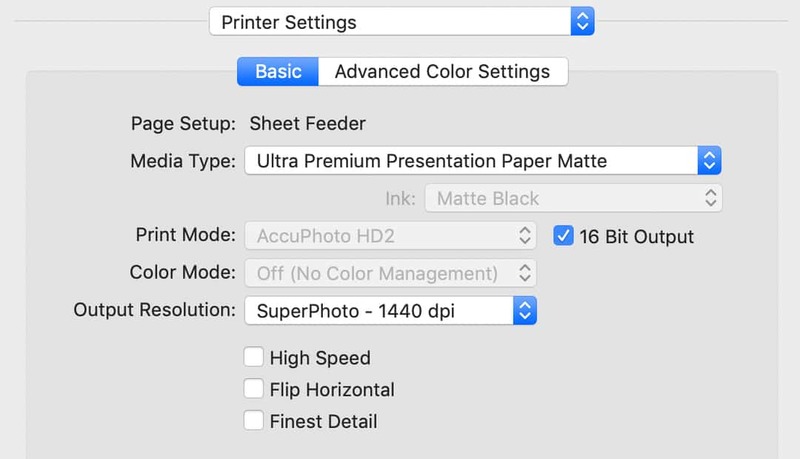 There are two options in the drop-down list which are “Performed by the App” (Affinity Photo) and “Performed by the Printer”. I always select the “Performed by App” option. If you do the same, be sure to also turn off the colour management in your print driver. You will need to do this separately on a Windows system. Pick the Printer Profile to use when printing. This is the ICC profile that you used with the Soft Proof Adjustment Layer. You must pick the same profile for both or you the print won’t be accurate. If you don’t do this and don’t have problems, you just got lucky. Select the Rendering Intent, which should be the same as the one you used in the Soft Proof Adjustment layer. If you’re wondering where some of the other paper options are that we looked at in the Mac section, they are in the Printer Driver. You need to open the printer driver and set them there before printing. You can do this using the “Properties…” button towards the top of the Print dialog. Soft Proof your image using the correct ICC profile for your printer. Be sure to adjust the soft proof to look the way you want to the physical print to look. Configure your printer driver to use the correct ICC printer profile and settings. Or, if you’re using Windows, configure your printer driver and the Affinity Photo Print dialog. After this, you should be safe to hit the Affinity Photo print button. And don’t forget to watch my Affinity Photo Soft Proofing video if you haven’t already. Affinity Photo is a great photo editing tool and just one alternative to Adobe Photoshop. You can learn about other alternatives in my guide to photo editors for photographers. Visit my Affinity Photo Tutorials page to browse through all the Affinity Photo tutorials on Lenscraft. If you still can’t find what you’re looking for, get in touch to make a request.